We have changed original configs for Socket System since the original one is too hard for private servers. 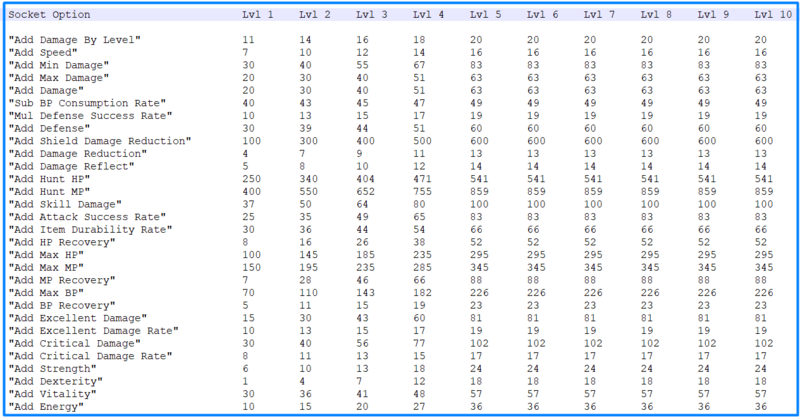 Values of Socket Options are changed since it is almost unreal to Upgrade from Level 1 to Level 10 Socket Option. Level 1 option value is the same as original Level 1 value. Level 2 option value is changed to Level 4 value. Level 3 option value is changed to Level 6 value. Level 4 option value is changed to Level 8 value. Level 5 option value is changed to Level 10 value. Levels 6, 7, 8, 9, 10 option value is changed to Level 10 value (Level 5 - 10 the same as Level 10). Hope you all enjoy these new configs because many of you asked for it . how can i make a socket ? Using ancient items and also you can just buy seed capsules from x shop to get level 1 seed and then upgrade to higher level. Much more info you can find just search google. You should change your attitude and thinking.. and stop being so lazy. It's 2018 and you do not know how to find info... Even in school students must use google to find info..